BBC NEWS | Programmes | From Our Own Correspondent | Iraq: Another Vietnam for the US? Iraq: Another Vietnam for the US? Fierce opposition to Iraq's draft constitution looks set to ensure there will be no withdrawal of US troops in the near future, and as the violence continues, the Vietnam comparisons return. "Can you go to Baghdad?" Five words which send a shiver down the stiffest journalistic spine. After covering more than a dozen conflicts during the past couple of decades, I was in no doubt as to what a trip to one of the world's most dangerous capitals would be like. 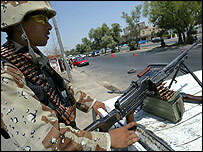 Two and a half years on from the war which brought down Saddam Hussein, death is still part of daily life in Baghdad. The past few weeks in Iraq have been particularly bloody. Twice in recent days my breakfast has been interrupted by the crump of nearby explosions and the crack of rifle fire. The continuing violence is fuelling yet more comparisons about whether what is happening here - with American troops bogged down in a seemingly endless battle against the insurgents - is similar to the United States' terrible experience in Vietnam. When I was growing up as a kid in the early 1970s, I remember watching BBC reporters in Vietnam talking about the demoralised American forces, unable to defeat their enemy. It was seeing these glamorous figures on television that made me want to be a foreign correspondent. Now, 30 years later, here I am in Baghdad grappling with the same issue in another country. Is this another Vietnam for America? It is an easy analogy for critics of the American presence here to bandy about, and the truth is that there are both similarities and differences. Half a million American troops spent 10 years in Vietnam fighting the communists before suffering their humiliating withdrawal. This time the United States' commitment is much smaller, casualties have been fewer and the aim is to leave heads-held-high much sooner. But in some other ways, the conflicts are alike. The American troops - just like their predecessors in Vietnam - do appear to have low morale. So far, almost 1,900 have been killed and the number rises every day. The soldiers can sense that life isn't improving here. One captain I spoke to said he feels as though his men are moving around Baghdad with their backs against the walls. He told me they can feel what control they had slipping from their grasp. 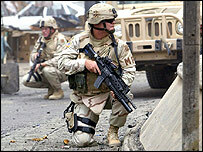 He said in his unit, part of an infantry division, many of his soldiers are beginning to lose faith in their mission. Falling morale goes hand-in-hand with a lack of discipline. There was a vivid example of that here earlier this week when an Iraqi working as a TV sound recordist for the Reuters news agency was shot dead by an American soldier. His only mistake was to have approached an area where there had been a shooting incident. Waleed Khaled appears to have been fired on without any warning. He leaves behind a wife who is four months pregnant and a seven-year-old daughter. The Reuters cameraman with him was injured and, although the main witness to what had happened, he was promptly arrested by the Americans. Before he was taken away, the cameraman was able to tell colleagues what had occurred. When an American journalist working for Reuters, managed to get to the scene with a British security adviser, he found the Americans laughing and joking around Waleed's body. They were also refusing to give the injured cameraman any water. The security adviser - a former British soldier - said it was apparent to him that the American troops wanted to clear away any evidence before there could be an outside inquiry. He said what was most worrying was that the unit did not seem to care that they had shot dead an innocent civilian. The American military authorities say their investigations are continuing. When I raised the matter with a senior British official in Baghdad, he admitted there was now a problem with American troops. He told me they did not understand how to win over Iraqi hearts and minds. Every civilian death means that another family turns against the Americans, he said. In Vietnam too, America lost the "hearts and minds" campaign with disastrous consequences. During the final years in Vietnam, the Americans started handing over more and more military responsibility to local troops - the policy of "Vietnamisation" - but they proved ineffective, unable to stop the communist onslaught. In Iraq today, there is a policy of "Iraqisation". Driving around Baghdad, I have seen more and more checkpoints manned by Iraqi troops, but they too appear badly led and trained. If you ask a question, they immediately look towards the American forces standing in the background for guidance. At one roadblock this week, I saw Iraqi troops with black woollen balaclavas over their heads, a bizarre sight in the stifling heat of the Baghdad summer. 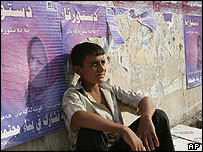 They did not want to be recognised, worried that they and their families would be targeted. It shows what little belief they have in their abilities. Even members of the country's new army are frightened of the insurgents. Mention Vietnam and Iraq in the same breath here and American officers raise their eyes despairingly to the skies. It is premature to make a real comparison but some of the similarities are becoming too close for comfort. The last thing the Americans want is another humiliating pullout. From Our Own Correspondent was broadcast on Thursday, 1 September, 2005 at 1100 BST on BBC Radio 4. Please check the programme schedules for World Service transmission times.